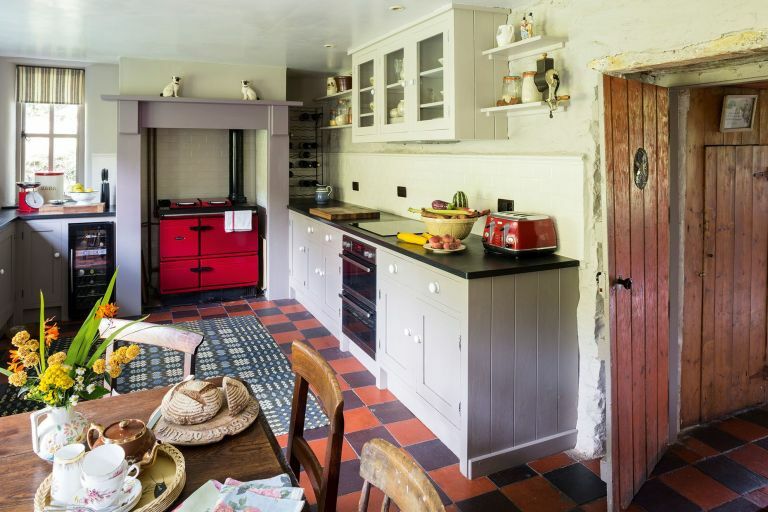 Tucked into the sheep-dotted hills of mid-Wales, Jane Beck’s restored cottage is testament to her sheer grit and determination. While many would-be renovators might have balked at the idea of taking on a house described by the surveyor as ‘uninhabitable’, with a young family in tow and very little money to spare, Jane relished the challenge. ‘It felt like an amazing adventure – at least in the beginning,’ she says. Find out how she achieved it, then browse more real home transformations... Read our guide on renovating a house, too, for more guidance. ‘My previous partner and I arrived back in 1997 with four small children, a Christmas tree, a few wrapped presents and £23 in our pockets. Our furniture consisted of just two leather sofas, which I still have,’ continues Jane. The search didn’t take long, as Jane made up her mind after seeing just one set of details. ‘The house was called Emporium, which seemed quite fitting as I’d always dabbled in buying and selling antiques,’ she explains. The house had lain empty for over 10 years and had fallen into complete disrepair. Walls had crumbled, windows were broken and the garden had become so overgrown with huge, leafy laurels and a vast yew tree that it was virtually impossible to see the stone cottage beyond. There was no electricity, no water supply and no bathroom or toilet. ‘Not long after we arrived, smoke began billowing out of the old range into the sitting room, and we discovered that the chimney was crammed full of jackdaw nests,’ recalls Jane. The cottage would originally have been a single-storey dwelling with a traditional crog loft (over half of the cottage) or mezzanine room in the eaves reached by ladder, where the occupants would have slept on a straw bed while their animals were housed below. In 1901 a proper staircase and two bedrooms were added, but that was the full extent of any previous modernisation. By the time Jane and her then partner, a builder, took it on, a tin lean-to at the back still served as the kitchen and pantry, and the internal walls were clad in hardboard. They began by knocking down the lean-to and replacing it with a proper extension for a new kitchen, plus three extra bedrooms and a bathroom above. They also pulled down part of the gable walls at each end as they, too, were badly in need of repair. Undaunted, she continued living at the house and doing the work as and when she could afford it over the next few years, all the while looking after a flock of sheep and some chickens. ‘All part of the rural idyll,’ she smiles. By the third winter, there was a roof on the extension and a bathroom. Things had definitely begun to look up for Jane – as well as making the house habitable, she found love again, and in 2001 married Trevor. She also started a new business, sourcing traditional Welsh blankets and antique quilts, and selling them from her front parlour and online. As her reputation grew, so did the piles of blankets and she now owns the largest collection in the world, all housed in a beautiful tin shed and shop across the road, which was built last year by local builder Alan Bailey. So successful has the venture been, that Jane and Trevor have been able to keep Alan on to help with the restoration of the cottage. ‘He has a great appreciation for the vernacular architecture and is putting everything right that, unfortunately, had probably been bodged before,’ says Jane. A new kitchen installed two years ago to her own design was the last major piece of the puzzle. ‘Having lived without a proper one for so long, I knew exactly what I wanted.’ Acres of slate from a nearby quarry have been used for the worktops, in keeping with Jane and Trevor’s intention to source as much as they can locally. ‘It’s very important to use what’s around us. Most of the furniture in the house came from around here; much of it from this particular valley,’ says Jane.